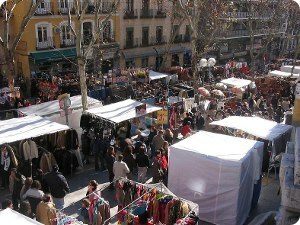 El Rastro is the most popular open air flea market in Spain. It is held every Sunday and public holiday during the year and is located between Calle Embajadores and the Ronda de Toledo (just south of La Latina metro station and Puerta de Toledo station). Along Plaza de Cascorro and La Ribera de Curtidores to Ronda de Toledo. Although there is a main street dedicated to Market stalls (predominately clothing) the side streets contain the real "treasures". A great variety of products (new and used) can be found at el Rastro. A number of antique shops in the local area are also open on Sunday. El rastro offers the visitor a curious and entertaining walk and a surprise with each step. In the past it was almost exclusively a market where anyone could sell antique objects that no longer used, or exchanged for other objects. At present, although there are still things of second hand, almost all products that sold are new: clothes, jewelery, handbags, decorative figures, etc. After a morning of purchases and bargains, one of the most recommendable options is enjoying some beers and tapas in the area of La Latina, one of the oldest neighborhoods in Madrid. Along Plaza de Cascorro and Ribera de Curtidores. Every Sunday and public holiday of the year, from 9:00 h to 15:00 h.